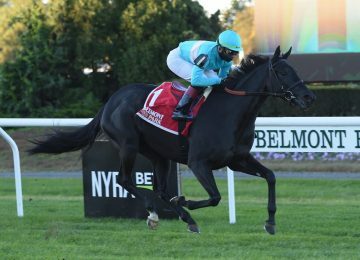 The weekend was highlighted by CHANNEL MAKER who won the G1 Joe Hirsch Turf Classic at Belmont by a resounding 4 1/2 lengths. Channel Maker was a BSW Private Purchase for clients Adam Wachtel and Gary Barber after his 3rd place finish in the G2 Summer Stakes at Woodbine in September of 2016. 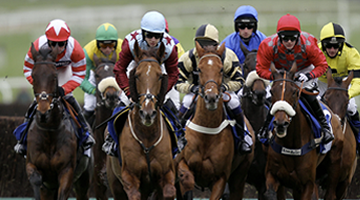 Since that time, he has flourished into one of the nation’s top male turf routers while earning over $1 million and registering a top Beyer of 108. 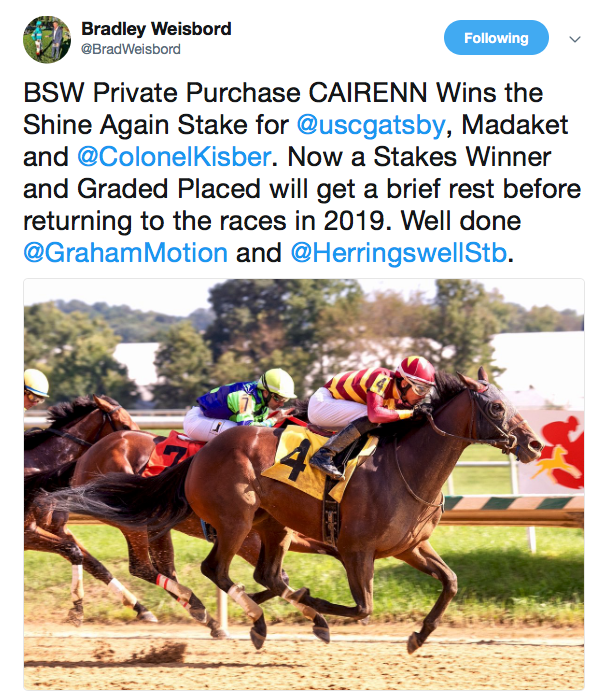 Another highpoint in the weekend came with recent BSW Private Purchase CAIRENN who won the Shine Again Stakes at Laurel Park. 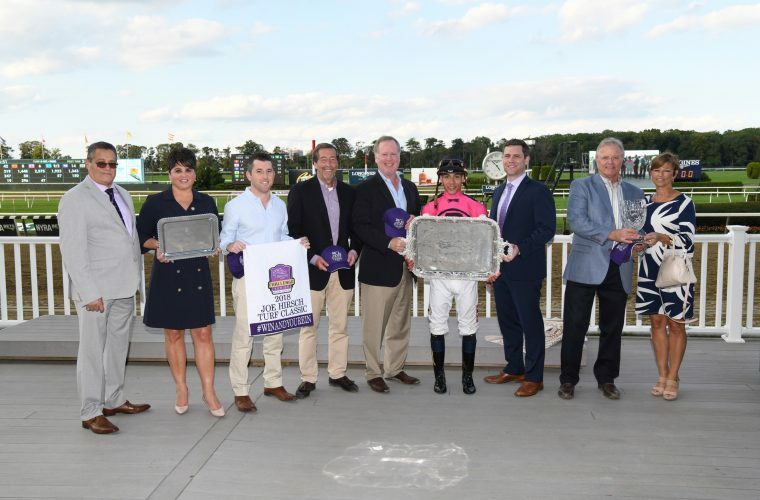 Purchased privately on behalf of BSW clients Scott Heider, Michael Kisber and Sol Kumin’s Madaket Stables, Cairenn hit the board in her first three starts for the new partnership before getting her first Stakes win here. BSW client Michael Kisber had a nice weekend double as his stable star, MIND YOUR BISCUITS, turned in an incredible performance over two-turns in the G3 Lukas Classic at Churchill Downs. Purchased Privately by Liz Crow for Michael Kisber and Sol Kumin’s Head of Plains, this was more than just another Graded Stakes win. 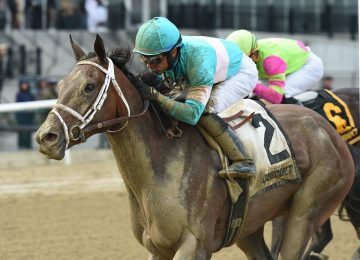 This was his second test over 1 mile and with this win, he is now a Graded Stakes winner over 6 furlong and 1 1/8 miles in 2018! 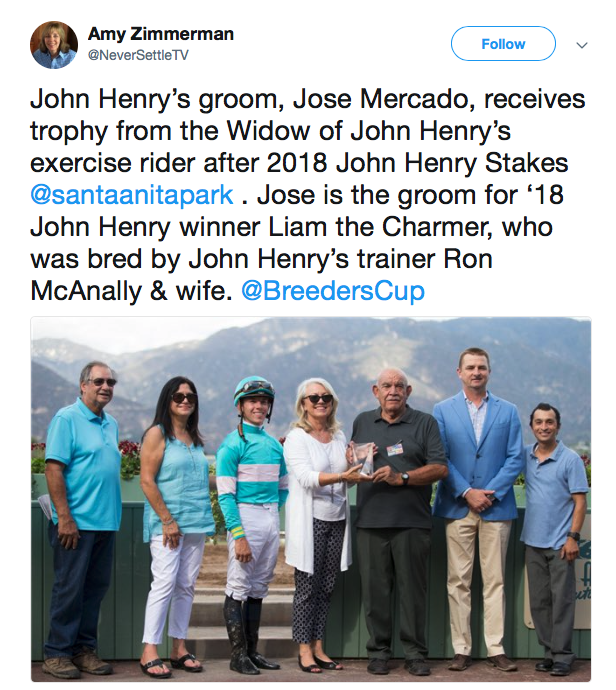 Trainer Mike McCarthy finished a great weekend for BSW client Sol Kumin on Sunday at Santa Anita when his charge, LIAM THE CHARMER, won the G2 John Henry Turf Classic! Liam the Charmer was a $100,000 purchase by Brad Weisbord at the 2017 Keeneland November Sale. Liam the Charmer is now 2-for-2 for Madaket Stables thanks to a wonderful training job by Mike McCarthy who has this 5yo son of Smart Strike running his best races coming off a 1 year layoff! The win was followed by a very cool moment in the winner’s circle… thank you Jose!